Home Trust of Skagit is a Community Land Trust which balances the multiple interests of homeowners, neighborhood residents, and Skagit County as a whole in serving as the steward of an expanding stock of permanently affordable, owner-occupied homes. The Home Trust of Skagit (HTS), a community land trust organization, is incorporated to help homebuyers in Skagit County secure affordable homes and achieve an equity return on their investment, while preserving affordability for the next homebuyer. The Home Trust of Skagit offers affordable homes now and preserves that affordability for future homebuyers. Our goal is to have homes in neighborhoods and communities throughout Skagit County, providing opportunities for both home ownership and affordable rentals, with a healthy mix of housing types and home size available to those earning up to 80% of the area median income (AMI). In 2008, more than 200 community land trust organizations were operating in 48 states with many in the Pacific Northwest. The Home Trust of Skagit (HTS) balances the multiple interests of homeowners, neighborhood residents, and Skagit County as a whole in serving as the steward for an expanding stock of permanently affordable, owner-occupied housing. 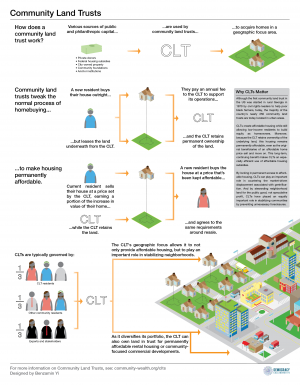 The Board of Directors consists of homeowners leasing and living on the HTS’s land (leaseholder representatives), residents of the CLT’s service area (general representatives), and individuals representing the public interest (which may include municipal officials) each make up a third of a typical board of directors. This tripartite structure ensures that different voices will be heard, with no single set of interests allowed to dominate. The Home Trust of Skagit Board of Directors began with twelve members, which may expand to fifteen. On an operational level, the Home Trust of Skagit takes on a range of responsibilities for developing and stewarding its lands, focusing on creating homeownership for Skagit County residents, while keeping the flexibility to develop other community facilities. In its capacity as steward, the Home Trust of Skagit provides the oversight necessary to ensure that subsidized units remain affordable, that occupants are income-eligible, and that units are kept in good repair. Because HTS retains permanent ownership of the land under housing and other structural improvements, we are closely connected to the homes and to the families that live in them. As the landowner, HTS will collect a modest monthly ground lease from every homeowner, allowing the HTS to monitor its assets, protect its investment, and support residents who experience financial difficulties. Most CLTs initially rely on grants from local governments, private foundations, or other donors to pay for stewardship functions. As its portfolio of land and resale-restricted housing expands, however, the Home Trust of Skagit can generate ground lease fees, resale fees, and other income to support the costs of managing the affordable housing stock. With growth, the revenues available for stewardship also increase, allowing the Home Trust of Skagit to make a permanent commitment to monitoring and supporting homes located on its land in Skagit County. The Home Trust of Skagit is looking for funds to build five additional units in Channel Cove, an affordable-housing complex that is part of the community land trust. A homeless crisis of unprecedented proportions is rocking the West Coast, and its victims are being left behind by the very things that mark the region's success: soaring housing costs, rock-bottom vacancy rates and a roaring economy that waits for no one. Skagit County cities and towns are demanding edits to the Skagit Council of Governments’ recent housing inventory report. A lack of affordable housing is one of the top issues for candidates running in the two contested Anacortes City Council races in the Nov. 7 general election. Home Trust of Skagit is a member of the Grounded Solutions network, which is committed to affordable housing. Home Trust announces they have received three grants in the month of June. U.S. News and World Report gives Washington good marks for health care and in fracture but not so good numbers for housing affordability. Not a surprising conclusion. Many are willing to reduce retirement savings or buy smaller houses. Investors are hitting the pause button developments that use tax credits to create affordable housing. Through Skagit County's Housing Affordability Leadership Group held its last scheduled meeting Wednesday, the work of the group will be continued through three subgroups. Cities in the Midwest and Great Lakes regions also make Realtor.com's list. Great Recession, student debt, mortgage rules all play role in increased appeal of renting. For more news visit us on facebook. Fill out this form and we will get back to you at our earliest convenience. Home Trust of Skagit is closed for all state and federal holidays.